John Wellburn was raised in Williams Lake, in the mountains of central British Columbia. 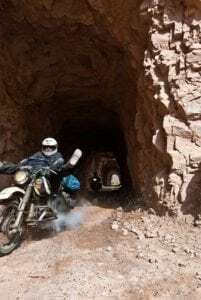 Born with a passion for travel and adventure, he’s been riding motorcycles since he could walk, His wanderlust and curiosity have taken him to exotic and off-the-beaten-path locations around the world. In 2004, the year before he met Rene, John set off on his vintage 900cc BMW to travel the world. 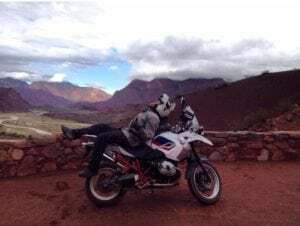 With winter approaching and funds dwindling, he stored his motorcycle with a family in Mendoza, Argentina and returned to Canada. Six months later, refreshed, refuelled, and recharged with funds, he returned, this time with his Canadian girlfriend. After retrieving his bike from the Argentinian family’s living room, John and his girlfriend continued to Ushuaia. There, in 2005, he met Rene who was just beginning his round-the-world trip. In a campground beside the river, John and Rene were part of a group of twenty bikers who’d converged at the end of the world and end of the year. Two weeks of celebrating, story telling, and bike fixing amongst like-minded people carried them into 2006. Rene headed off to Buenos Aires to arrange for shipping his bike to South Africa. John’s girlfriend flew home, and his seventy-five-year-old father flew down for the trip of a lifetime. John and his dad, two-up on his old BMW, crossed the Amazon from Buenos Aires to Caracas, Venezuela. His father flew home while John contemplated where he’d go next. Europe seemed most likely. 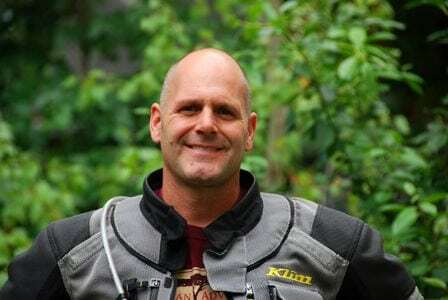 He tore down and crated his bike for shipment when the time came, left it with a group of bikers he’d met, and returned to Canada for a few months to finance the next leg of his trip. Organizing shipping from Canada proved unmanageable so he bought a new bike in Europe and left the old BMW in Caracas, where it would stay crated for nine years. In spite of his wanderlust, he developed a desire to buy a plot of land. Prices in Canada were higher than his budget and he’d fallen in love with Mendoza. Browsing the internet one day, he found a place there he could afford. In 2007, he jumped on a plane to Argentina with only his backpack, and bought the twenty-acre plot. John planted two acres of vineyard, eventually made wine, became fluent in Spanish, and lived his dream. Two years later, he met Carolina, now his wife. When John’s brother-in-law and a friend decided to ride from Williams Lake to Ushuaia in 2013, John couldn’t help but join them. He flew up to Venezuela only to reunite with a bike that was now in boxes of parts. While waiting for the others to join him, he rebuilt it from scratch. He led his visitors back to Mendoza, picked up Carolina and continued to Ushuaia. Then it was back to Mendoza for John and Carolina and his prized vintage BMW. 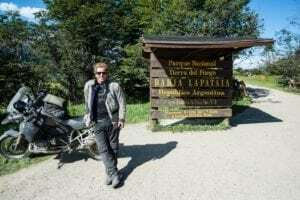 Once back, he began working for an Argentina-based German motorcycle tour company, guiding mostly Europeans between Ushuaia and the northern border of Argentina, a distance of six thousand kilometres. During that time, he and Rene stayed in touch. When Rene expressed an interest in running tours in South America, John left his employer and joined up with Renedian. Since then, he’s helped develop the Journey to Ushuaia route, including last fall’s beta trip. He’s guided a private tour in Peru, participated in the Gobi Discovery trip and will return for the Golden Eagle Festival. Then it’s back to guide this fall’s Journey to Ushuaia. John enjoys the variety his lifestyle provides. He says routine, his greatest fear, gives him sweaty palms. While he’s not touring, he works in Williams Lake as a mechanic and auto body man, restoring one vehicle a year. He’s also a very accomplished photographer and writer. Visit his website, www.JohnWellburn.com to see his photographs and articles. 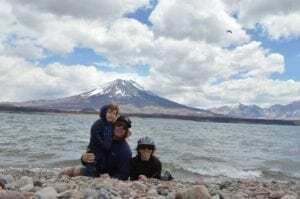 John, Carolina, and their four-year-old son Roy divide their time between Mendoza, Argentina, and Williams Lake, British Columbia. A second child will join them in March.